The Lexus New Takumi Project is a project organized by LEXUS, the luxury vehicle division of Japanese automaker Toyota, to support Japanese craftsmen and designers in their creative ventures, emphasizing their local uniqueness and talents in creating new challenging products. 'Takumi' in Japanese, means master or artisan. The project began in 2016, led by a group of supervising support members such as broadcast scriptwriter and creator Mr. Kundo Koyama, fashion journalist and art producer Ms. Yoshiko Ikoma, and design producer and editor Mr. Kazuya Shimokawa. This year marks the third instalment of the project with 50 young talents, 'Takumi's, selected from 47 prefectures of Japan. Each selected 'Takumi' is assigned to one supervising support member as a consultant in each of their creative processes. Last summer, a kick-off session was held at the Lexus Gallery in Takanawa, Tokyo. This was followed by a visit by the support members to their respective 'Takumi's to their studios to discuss and assist in the development of each of their individual ideas for their products. On January 24 this 2019, a showcase event was held at Tokyo MidTown Hibiya where all the 'Takumi's gather to present their completed works. Monocircus founder and representative director, Kazunori Takeishi, was selected as one of the 'Takumi's representing Fukuoka prefecture. Kazunori, creator and designer of Monocircus' 3D printed accessories, created an intricately designed sculptural work entitled, CURRENT, with the use of 3D printing technology under the assigned consulting support member, Mr. Kazuya Shimokawa. The work depicts the dynamic moving school of fishes underwater and captures the delicate details of each fish, resulting in a very intricate art work. 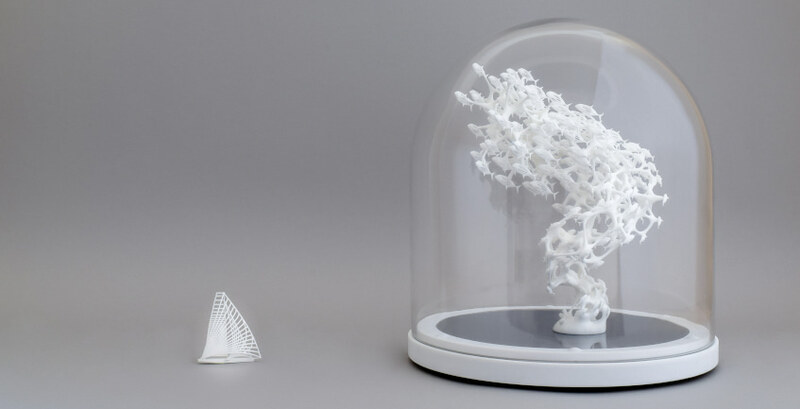 The intricacy of the structure is not only impossible to be carved by hand, it has also been quite a challenge even to the 3D printing production process. Changes had to be made several times due to parts that are too delicate and impossible for printing, whilst over-thickening parts would cause the work to lose its intricacy and dynamism, so it had been quite a struggle in the creative process to achieve just the right balance and establish the desired outcome. The object is placed within a glass dome and installed with LED lights at its base, giving it an alternative impression when lit. CURRENT is available for purchase and will require about 4 to 5 weeks for production.